Decided to jump on the dyno today just to see where it stands on pump gas and get my feet wet with it. For those that may have missed it we're using a FFTEC 6466 kit. I ran it at ~19.5psi with a pump gas flash I've been street tuning and it did pretty well. The car has 3.46 gears so these runs were done in 5th gear as 4th was just too short of a pull to see what was going on with the tuning. The car has midcats in place currently. Overall, not a bad starting point. Next up we'll be reworking the exhaust a bit and raising the boost/advance for some E85 tuning. How does the trans seem to be handling this power right now? just when i was starting to get a little coky you have to pull this out.. I think the top mount twin scroll using the same turbo is going to be the ideal choice for your car. What's the AR on the exhaust turbine on the 6466. Maybe a little boost ramp would make it easier to handle when boost comes in. If you look when it's about to hit full boost, 4.2k rpm-4.5krpm it shoots over 100whp. In just 300rpm LOL. I can only imagine what a handful it is. congarts Terry amazing numbers !! btw could you give us cost estimate for top mounted ST setup include all hardware turbo, WG.. etc ? Including labor, fluids, tax, etc, around $10k installed and out the door. Any thoughts of opening a shop in Mass? I'd be in. We don't do labor so I just shipped our car over to FFTEC. Anyone want to buy a N55 135i? I need an N54!! 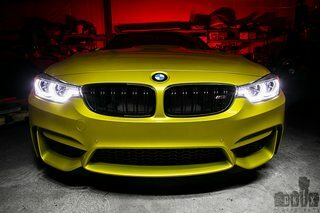 BMW Performance Kidney Grille, CF Lip Spoiler, CF Diffusser, Blackline LCI Tailights, Magnaflow Full Exhaust, BMS Intake, Jb4 w/ E85, Meth Injection, BMS **, VRSF 5" Intercooler, CP-E Charge Pipe, KW CS Coilover, M3 Subframe Bushings, VMR VB3 Wheels, Stage 2 Fuel Pump, M3 Control Arms, Dinan Camber Plates, Pure Stage 2. For those interested in the boost solenoid testing we're doing. MAC @ 20hz, 25-70% duty cycle (e.g. its usable range), OEM at 2.4khz, 0-100% duty cycle. just to clarify, both of the ST setup are on 135 ? any plans for 335 ? One on our 135 and the other on our 335. Any progress on this? 600whp yet? Are there any performance advantages with a top mount turbo ? What are the differences between the two setup ? The car is up at FFTEC getting a custom exhaust made right now and an install error corrected on the drain line. Hope to get back to work on it in a week or two.